I have a couple of reasons for researching new recipes, or creating my own dishes. One of those is my need to cook something new and healthy, or just new 0_o and tasty. The other reason, which is much more annoying is of course, guess who!, YES, Cookies. He likes to harass me with complaining, like: “Babes, I don’t want the grilled chix anymore, it’s boring”, It's easy and fast – I’m growling under my breath. SO?? my beloved one asks… “and this salad… I don’t want the household salad, it’s boring… and the dressing is too sour, too liquidy, too oily, too peppery oh, and don’t put sweet pepper in…” the next time I served him plain napa cabbage just cut into strips… He ate it and didn’t complain for another week…victory! Start from the dressing, take a jar, add all ingredients, cap it and shake good, set aside. This time it is really easy, cut, rip, chop or cube the way you feel about it, I like big pieces, and of course, Cookies, well, he likes small pieces - so I go half and half 0_o. 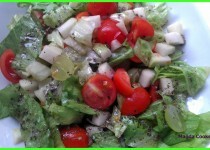 Cut tomatoes and grapes in half, and dice kohlrabi. 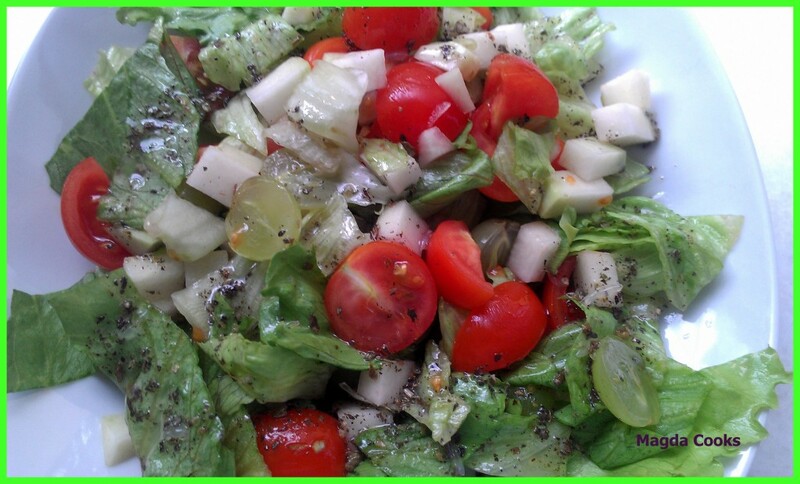 Toss together in a bowl, pour the dressing 5 minutes before serving and enjoy easy veggies for any meat meal.